I was recently commissioned to build a machine that would perform a very interesting and unusual task: Count how many times a wire had been wound around a ring by measuring its electrical properties. 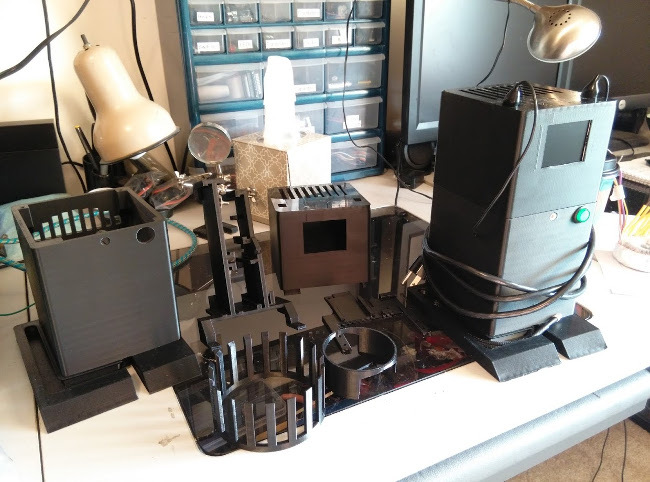 This task was a relatively involved one, as it included a ground-up design of the circuitry, making choices about component prices and their compatibility, and creating a fully 3D-printable casing that the machine could be built into. After months of designing, prototyping, and testing, though, the Sidewinder transformer tester achieves accuracy of 99.7% or above in estimating the number of turns within its calibrated range–or in simpler terms, it may be off by one if you’re measuring 100-2000 turns, or off by a couple from 2000-5000. Not bad when it could be off by considerably more and still be useful, and is making measurements on the order of thousandths and ten-thousandths of a volt. To use the transformer tester, you attach its clips to the ends of your wire and run its probe through the center of the transformer, then hook it back into the machine. Press the measure button, and twenty seconds later it will show a number. During that short pause, the tester examines the transformer it’s connected to by ramping up its supply voltage and measuring how much is induced on the probe. Once it finds an adequate number that won’t cremate the transformer but also provides suitably high induction, it takes a weighted average of samples at that voltage, then proceeds to take additional equivalent samples from the most similar windings of a standard transformer housed inside the machine. At this point it generates an answer based on simple transformer calculations, adjusts that answer based on the properties it noticed at its current voltage on the standard transformer, and then adjusts the answer once more based on a linear interpolation of pre-verified tests of other transformers with similar properties. This final number is then shown to the end user. If the user is winding a batch of precision transformers, a rocker switch on the back enables what’s called “golden standard mode.” Say, for example, the machine reported 744 turns on the first transformer in the batch, but the operator knows that his or her transformer has precisely 745. By pressing up once on the rocker, the machine records an offset between the answer it noted for the 745T and what the answer should really be. It is then zeroed in to precisely identifying transformers with 745 turns, and the rest of the batch can be wound quickly with much less attention to counting. The heart of the transformer tester is an Arduino Uno (actually a cheap Chinese clone of one to keep costs at a bare minimum), and in hindsight, I definitely should have gone with an Arduino Mega instead. 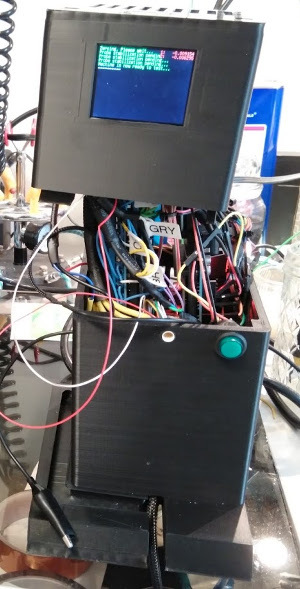 GPIO real estate is completely used up, to the point where the rocker switch on the back of the machine shares its inputs with the measure button on the front such that if you press the button, the machine sees that the rocker was activated both ways at once and knows you hit measure. Electrical capacity could be better, as it’s having to drive two 24-bit analog-to-digital converters on SPI, a color serial display, and twelve 5V relays that are often activated four at a time. The 2 kilobytes of SRAM are maxed, to the point where words are abbreviated in the machine’s console-like debugging mode in order to free up bytes here and there. Still, the Uno delivers and holds stable, able to take measurement after measurement accurately and without complaint. I won’t go into great detail on the machine’s other specifics since this is one of my rare projects that is not licensed for open source, but the power system consists of a custom transformer delivering five levels of AC voltage, a wall power adapter providing higher DC voltage to a pair of AC to DC RMS chips, and a 2A cell phone charger providing 5V power to the Arduino and its peripherals. It only accepts 110V power; however, I assume since it’s for a transformer manufacturer, they can get that sorted out when necessary. The display is the fantastically durable and simple-to-use Digole Serial Display Adapter, and the buttons are standard Amazon fare, with a car window switch serving as the rocker for golden standard mode. Total cost of all components and filament in the machine is a hair under $100, which I am extremely proud of considering other transformer testers run in the tens of thousands and don’t perform tests anything like this. A ratio of windings is great, but it’s practically useless to the factory worker who is just manually counting off turns to the next tap. This machine provides a quick test with simple results anyone can understand before the transformer ever makes it to quality control, meaning fewer transformers get scrapped or torn down after passing through the expensive tester run by trained technicians. What’s not cheap or particularly easy, though, is the labor in building one of these. 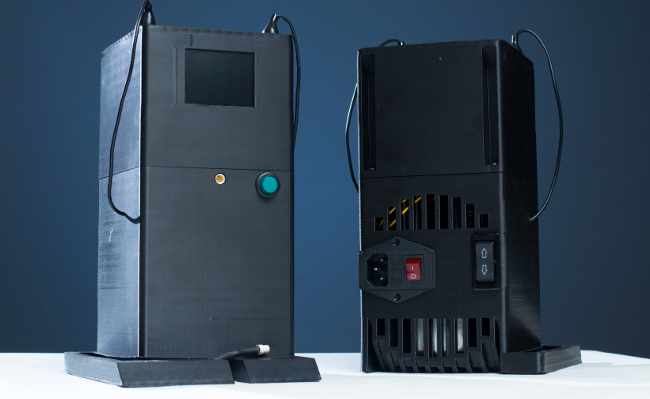 The parts when printed on a reasonably mid-tier 3D printer take a solid 65 hours to complete, and skilled assembly can run close to fourteen hours due to all of the soldering, harness building, and wire routing. 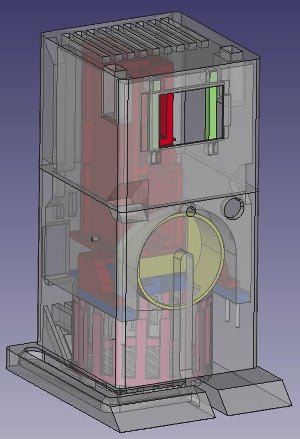 Luckily, most everything in the machine could be printed onto a single board if necessary, greatly reducing these barriers for future models. All in all, it’s a pretty neat little piece of hardware.